Wonderful night image capture! Congratulations on your top 10 finish. Congratulations on your top 10 finish. Very good shot! Congrats on your top ten! I just loved this shot! Well deserved. Nice intense line of green, ethereal fog, good composition for placement of lights in frame, although they are quite in-your-face. Interesting. This is by far the best photograph submitted in this challenge. Good luck on first place. You deserve it! I vote a perfect 10! Good concept, pretty well executed. If it had been me, I would probably have cropped in a bit, maybe doing portrait mode to get the rightmost two lights, bleachers, and some of the grass. As it is, the brightness of the lights keep my eyes so high, I almost miss the beautifully lit fog. I like the clean lines and simple composition. I wonder if a grad ND filter would have done anything for you. 7 for now. i have 2 candidates for the winner. This is one of 'em wow! ....p.s. re looked at all my 10's you win! really a good photo. perhaps a bit tilted on the the right but with a great atmosphere. Very strong image. A graduated ND filter might have allowed you to get the fog exposed as you did without blowing out the lights so much, but I kind of like them blown out like that. They look like big lollypops and give this a very playful nature which I think is appropriate to the theme of the game. I would have zoomed in so the fog becomes more prominent. It is a bit subtle but a great idea none the less. Interesting concept and well done. But I can't keep looking much at the image (as I'd like to) as those blown up lights are quite obfuscating - they really hurt the eyes. Great! 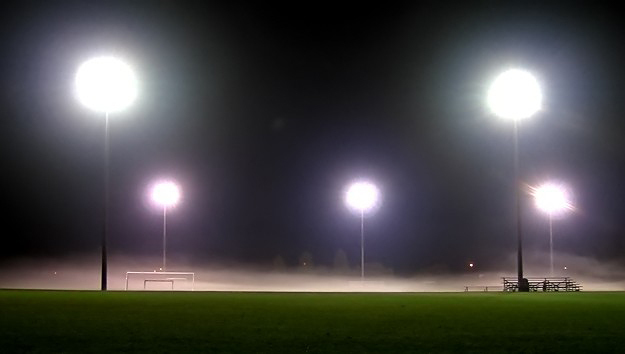 love the lights and the fog. Proudly hosted by Sargasso Networks. Current Server Time: 04/19/2019 12:34:59 PM EDT.